Back in July, we talked about the Government Accountability Office’s investigation in which the GAO created a fake company that was successful in one out of three tries at getting a license for radioactive material. Once they received the license and placed an order, GAO then altered the license to increase the quantity of material authorized and placed a second order. The higher quantity would have required additional protection measures beyond those required for the original quantity. The GAO never actually acquired any radioactive material and the public was never at risk. On the day the GAO issued their report on the investigation, Commissioner Jeff Baran sent a memo to the other Commissioners proposing that NRC staff re-evaluate the methods used to account for Category 3 sources. 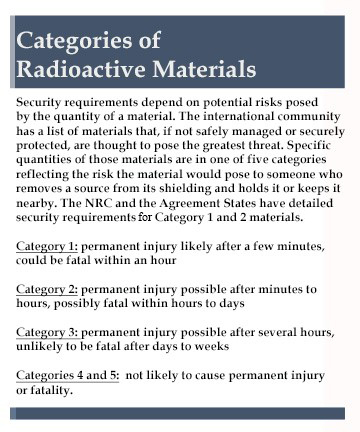 (See “Categories of Radioactive Materials” at right). The other Commissioners agreed and the Commission directed the staff to evaluate whether we should revise NRC regulations or processes governing protection and accountability for Category 3 sources. Getting input from Agreement State partners, non-Agreement States, licensees, public interest groups, industry groups, and the reactor community. We will also consider recommendations made by the working group that evaluated the vulnerabilities identified by the GAO investigation. Additionally, we will consider our recently completed assessment of the security requirements in 10 CFR Part 37, “Physical Protection of Category 1 and 2 Quantities of Radioactive Material.” This review looked at the results of inspections of NRC licensees during the first two years the rule has been in effect, and events reported under the rule. The NRC sent a report on this review to Congress on December 14. The NRC staff will develop recommendations related to Category 3 source protection and accountability and provide the recommendations to the Commission for deliberation in August 2017. An important part of the NRC’s and Agreement States’ re-evaluation is soliciting input from our Agreement State partners, the impacted regulatory community and the public. We have published a series of questions in the Federal Register to help assess the benefits, impacts, and costs of different alternatives. You can see these questions and send us your comments through the federal rulemaking website. We will provide opportunities to participate in the agency’s decision-making process through public meetings and webinars. More specific information about these opportunities for public involvement will be available on a new webpage. We welcome your input. “Outer space” may not come to mind when you think about the NRC. But we’re excited to be involved with NASA in the planning for a 2020 launch of another Mars rover. The Mars 2020 rover mission is part of NASA’s Mars Exploration Program, a long-term effort of robotic exploration of the red planet. Designed to advance high-priority science goals for Mars exploration, the mission would address key questions about the potential for ancient life on Mars. The mission would also provide opportunities to gather knowledge and demonstrate technologies that address the challenges of future human expeditions to Mars. The mission would take advantage of a favorable launch opportunity in 2020 when Earth and Mars are in ideal positions in their orbits for a Mars landing in early 2021. So what does planetary exploration have to do with the NRC? Well, like past missions of this type, the Mars 2020 mission will use a Multi-Mission Radioisotope Thermoelectric Generator – which goes by the fancy acronym of MMRTG. That’s a fancy name for using the radioactive decay of plutonium to produce electrical power needed to run the rover and its instruments. Since the NRC regulates the safe use of radioactive materials, we are part of the Mars 2020 Interagency Nuclear Safety Review Panel that NASA has convened to assure the safety of the launch. This process was originally put in place by Presidential directive and is used each time the U.S. prepares for this type of launch. In addition to NASA and the NRC, the panel includes members from the Department of Energy (which builds and owns the MMRTG provided to NASA), the Department of Defense and the Environmental Protection Agency. I am honored to serve as the NRC-appointed technical advisor to the panel. The panel’s job is to prepare a Nuclear Safety Evaluation Report — which will be delivered to the White House’s Office of Science and Technology Policy as part of NASA’s request for the President’s authorization of the launch. The panel will evaluate the potential radiological hazards associated with the launch, and the methods used to mitigate the risks. The NRC has served a similar role in other NASA launches over the past several decades, most recently with the 2011 launch of the Mars Science Laboratory mission and its rover, Curiosity. In addition to this important activity, the NRC and NASA share knowledge in safety, reliability, and risk analysis methods and applications though a Memorandum of Understanding and other interactions. NRC policy requires other federal agencies to reimburse us for providing services that aren’t part of our statutory mission. So NASA will reimburse us for labor and travel costs associated with our service on the launch safety review panel. In other words, NRC’s licensees (such as nuclear power plants) don’t end up footing the bill for NRC’s participation in this activity. More on the Mars 2020 mission can be found at NASA’s website, and in the associated Final Environmental Impact Statement associated with this mission. When Marie and Pierre Curie discovered Radium-226 in 1898, it opened up the atom’s secrets and offered hope that its mysterious radioactive rays were a miracle cure. Sobering reality replaced euphoria as radium factory workers began to die. Radium taught the world of radiation’s dangers, yet it was not until 2005 that Congress put all aspects of radium safety oversight under the federal government. Until that time, it was primarily regulated — to varying degrees — by the states. This three-part blog series traces radium’s long unique history where states took the lead in regulating it and compensating victims. Manufacturers hawked quack products they claimed were laced with radium as a miracle cure and status symbol: elixirs, kitchenware, clothes, pillows, razor blades, and cigarette holders, even condoms. Radium’s luminescent properties also made possible glow-in-the-dark paint for watch dials. State labor and health agencies were able to halt lip pointing, but their power over industry was sometimes limited. For example, the New Jersey Labor Department issued to U.S. Radium Corporation an order to tighten safety for its dial painters — “comply or close.” It closed and moved elsewhere. Federal agencies mostly deferred to state authority over radium. They issued studies, organized conferences, and developed voluntary safe work practices. The Federal Trade Commission had some influence in shutting down falsely advertised products, such as the “fountain of youth” tonic Radithor, but safety assurance was a state prerogative. With World War II, change came as nuclear reactors of the U.S. wartime atomic program flooded the world with new isotopes, reducing to near insignificance radium’s commercial and medical applications. The Curies’ Nobel-Prize discovery was about to become an afterthought. Part II will be posted on Wednesday. The Government Accountability Office (GAO) published a report today on a “covert operation” they conducted to test the NRC and some states on the process of issuing licenses for possession and use of radioactive materials. First some facts: GAO established a fake company and made three attempts to obtain a license. GAO was successful in only one case. As part of their operation, GAO then altered the license and placed orders for radioactive material with two companies that could have resulted in GAO receiving double the quantity of material authorized in the license. That quantity of material would have posed a higher potential risk than what was actually authorized in the unaltered license, and would have required additional security measures. In the language of radioactive materials categories (see box), the fake GAO company had a valid license for a Category 3 quantity, but used a modified copy of that license to order a Category 2 quantity. It is important to note that the public’s safety was never at risk because GAO never actually obtained radioactive material. The license GAO obtained was granted by one of our Agreement States (the 37 states that regulate radioactive materials under agreements with us). After we learned of the GAO actions, we immediately made sure that the Agreement State knew the license was obtained under false pretenses and revoked it, and notified manufacturers and distributors of the revocation. We also made sure that the 36 other Agreement States knew about the issue. Our next step was to figure out what went wrong. Working with the Agreement State that issued the license, we found that the licensing staff did not complete all the required steps of the pre-licensing procedures. In GAO’s other two attempts, the licensing officials who correctly denied GAO’s fake company a license – in another Agreement State and in an NRC regional office – did follow all the steps of those procedures. Knowing the root cause helped us to focus our corrective actions. The NRC and all the Agreement States responded with steps to improve training and underscore the importance of following procedures. All licensing and inspection staff at the NRC and in the Agreement States completed this re-training in December 2015. NRC and Agreement State officials also formed joint working groups to see what additional lessons can be gathered from the GAO operation. These groups have been meeting since January 2016. Among their tasks, the groups are reviewing the pre-licensing guidance and evaluating new strategies to improve license verification and transfer procedures for the quantity and type of material involved in the GAO sting. The groups will also consider GAO’s specific recommendations. Once this work is completed, the NRC staff will present to our management and Commissioners any policy questions that emerge from the reviews, including whether we think changes are needed to the current security and tracking requirements for radioactive materials. The NRC takes radioactive materials security very seriously. We participate with 13 other federal agencies on a U.S. Government task force that has evaluated the security of radiation sources in the U.S. over the past 10 years. This group has identified no significant gaps in source security and recommended no legislative changes. Based on this comprehensive, ongoing review, we believe current NRC regulations for licensing radioactive sources remain adequate for protection of safety and security, consistent with the risks they pose. Nonetheless, the NRC is doing what it can to see what lessons from the GAO operation can be applied to strengthen radioactive materials security.